And so another month has ended and a new one is beginning. We're into April, how mad is that!? I don't know about you, but I'm quite looking forward to April. I have a couple of weeks off of uni, where I'll be child minding then I'll have begin the dreaded revision for the oh too soon exams. However, I do love how April is officially Spring. I know March should be the start of Spring, and granted we have had some nice days, but April should hopefully allow me to shed my winter jumpers and maybe stop wearing boots every other day. To round up this month, I've got a wee favourites post coming your way, but as its becoming a monthly routine of sharing all my instagram pictures, here is my March post! As I'm sure you've become accustomed to if you've been following my instagram account for long, my doggy Alfie features a lot. So it only seems right that Alf is the first one on this round up. It was Alfie's 3rd birthday at the start of the month. Other dog owners will know what a big deal this is, and its only right to give him cards, presents and lots of cuddles - just like any other member of the family. I bought myself a big bunch of flowers to help brighten up my room. I never usually have flowers but having the bunch made my room smell awesome and made me smile whenever I saw them. It was mother's day at the start of the month, so I did a little shout out to my beautiful mum. She's such a wonderful woman and always knows how to calm me down when I'm stressed or cure my hundreds of aliments. And on top of that she gives the best cuddles. As flowers are such a novelty for me, I wanted to show them off. I felt like a right ol' grown up having flowers in my room, anyone else get like that? As I've said countless times, Alfie is a massive feature of my instagram, and having a trip home with him of course requires lots of cute photos to be taken and shared. On my now monthly trip home, I complained how my dad's shops seemed to be lacking in sugary, unhealthy treats. My mum seemed to pick up on that and bought one of Costco's massive tubs of tangfastics, which helped us all through our study afternoons. I took a trip to the Edinburgh vaults alongside Eleanor, and managed to get this 'terrified' snap. If you didn't see my post on that, then make sure you catch up on my antics here! Eleanor was a super lil sis and got me tickets to see Little Mix for my birthday. And because she's super cute, we kept them in this wallet until it was time to see the girls. The Little Mix concert was incredible, and I was able to get some really awesome pics that I'm super proud of. This one was during The End, where their voices were perfection. Another snap from the awesome seats that we had is this one from Secret Love Song, where the whole audience sang along beautifully. A full concert post is written and ready to be published in the next couple of days! I'm always one for finding new pubs & bars in Edinburgh, and I only wish I'd been told about Hoot The Redeemer sooner! The bar is so quirky, with mix your own cocktails, popcorn that gets replenished as soon as you hit the bottom and a live dj who has his own entertainment booth. My favourite thing about it was that it served 'adult icecream' where the little pots had an alcoholic twist. As it was 'national puppy day' at the end of the month, how could I resist an opportunity to post this adorable throwback of Alfie. He was such a little weirdo when he was a pup, but looks like a little angel as he slept like this. I took a stroll on Easter Sunday after a weekend of being in bed ill with the flu so that I could experience a little of the blue skies that were over Edinburgh. As I walked down to Princes Street Gardens I was able to get this shot of the castle, which is such a beautiful spot. March did bring with it a little bit of spring, and these cherry blossoms reminded me of the sunshine to come. I can't wait to see the meadow paths decked out in the beautiful pink blossoms. This month has been tough going, what with all the deadlines and stress that comes with it, so I'm pretty glad its now out of the way. We'll just have to wait and see what April has in store! Be sure to follow me over on bloglovin too [here], where you'll see my posts as they go up, and you'll be ready for the lifestyle favourites post that is on its way. 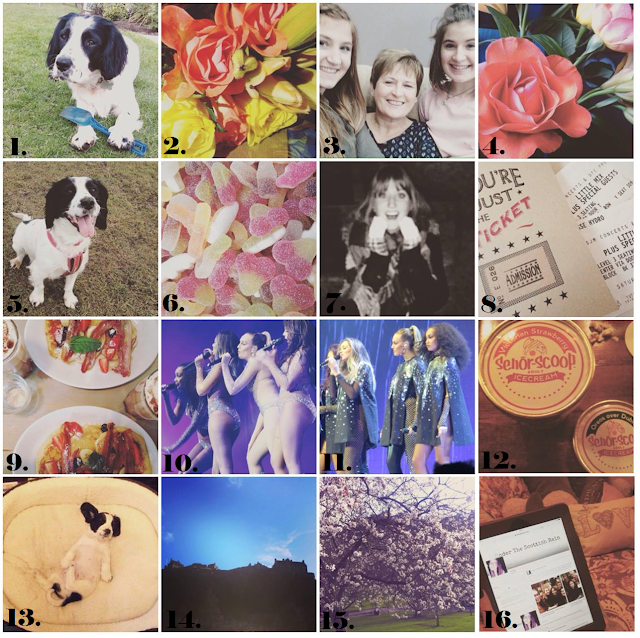 As always, I'd love to hear what you got up to this month & any of your March favourites!